One of the things you’ll notice about our Guelph dental office is how long our staff has been working with us. Not only does this reflect how much we love our jobs, it also shows how much we love our patients. Many of our staff have been here for more than 5, 10, and even 15 years! Book a visit now. We’re open on Saturdays. 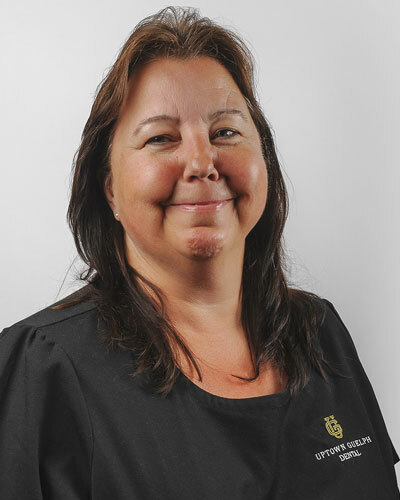 Kelly has been with our office for the past 17 years, spending most of her 27 years in dentistry with us. She completed her Dental Assistance education at George Brown College, and her Dental Hygiene education at Georgian College. Kelly enjoys working together with clients towards a common goal of a healthy mouth and body. She is a mom of 2 great daughters. Kelly’s hobbies include quilting, woodworking and antiquing. She also takes to the outdoors for skiing, snowshoeing and long walks. 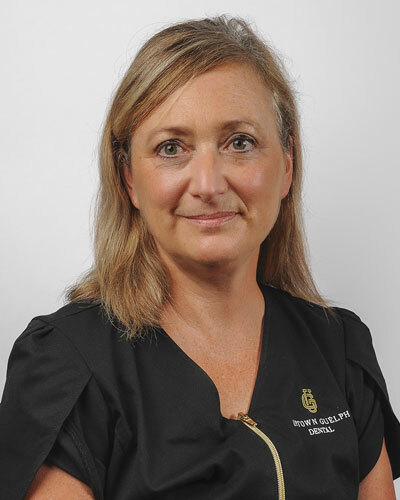 Monica has worked in dentistry for the past 24 years, 10 of which she has been at our practice. Dentistry is a family tradition: her father practiced dentistry for 45 years and her brother is also a dentist! She obtained her Associate Degree in Applied Science for Dental Hygiene at Onondaga Community College. Monica loves helping patients achieve a better level of overall health by getting their mouth healthy. She finds it very rewarding when patients tell her they notice a difference. Monica is a mother to 2 teenage boys, who keep her busy with their high level hockey competitions! Monica enjoys working out, puzzles, gardening, reading and spending time with family and friends. Shelley has spent 8 of her 33 years in dentistry with our practice, which she considers her “work family”! Shelley became a Certified Dental Assistant at Seneca College, Toronto in 1984. In 2009, she became a Registered Dental Hygienist at CCDH, Burlington in 2009. Shelley enjoys helping her patients strive to be healthy, and seeing new and familiar faces every day! She values continually learning. Outside of the dental office, she likes to spend time with her growing family of children and grandchildren. Shelley also has a zest for travelling and experiencing new sights, exploring small villages, meeting new people, and trying different foods. Photography and interior decorating are two of her creative hobbies. 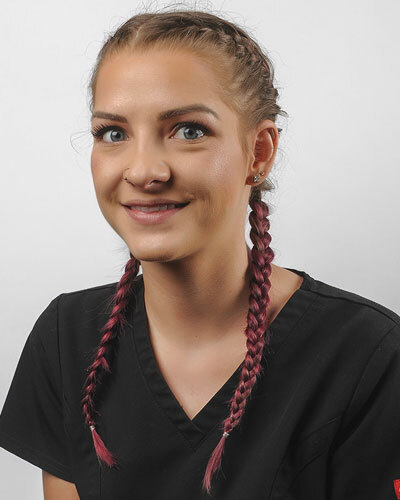 Out of her 6 years in dentistry, Jenessa has been with our practice for 4! She received her diploma in Dental Hygiene from Cambrian College. Jenessa finds interacting with friendly faces and helping people reach their dental hygiene goals to be very rewarding. Her hobbies include volleyball, snowboarding, sports, music and watching movies. She enjoys spending time with family and friends. Jenessa is currently happily on maternity leave with her amazing son, Clark! 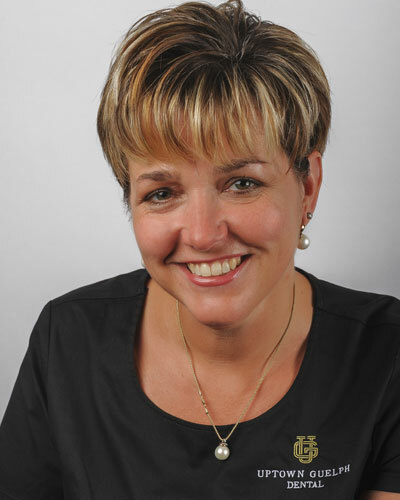 Claire has been with our practice for 2 years, but has 27 years of experience in dentistry. She is a graduate of Algonquin College’s RDH Program, and is always seeking to learn more about the latest dental trends. 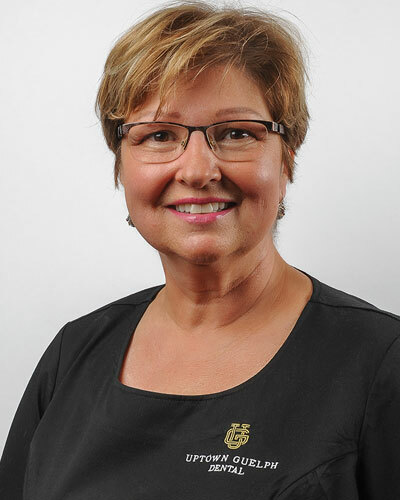 A Guelph local for the past 30+ years, Claire loves our city immensely and serves as a volunteer for various community events, including the Bracelet of Hope. Claire loves working with an exceptional team that enjoys coming to work and achieving common goals together. Claire enjoys getting to know patients and helping them achieve good oral health. She likes to connect with friends, family and neighbors, as well as spend time with her husband and boys. Claire appreciates good food, good wine, and walking the dog in the woods. Nelly has worked at our office for 4 years, and in dentistry for 16. She has a degree in Dentistry from the University of Colombia, and is certified as a Dental Assistant by the National Dental Assisting Examining Board (NDAEB). Nelly treasures working with the wonderful team at Uptown Guelph to ensure that patients leave our office happy with their dental work. She loves helping create beautiful smiles, relieves pain, and improving patients’ oral health. Nelly is happily married with two beautiful daughters and an adorable dog, Bruno. She speaks Spanish fluently. She enjoys spending time with her family, biking, indoor rock climbing, and reading. Nelly lives by the golden rule: treat others the way she wants to be treated! 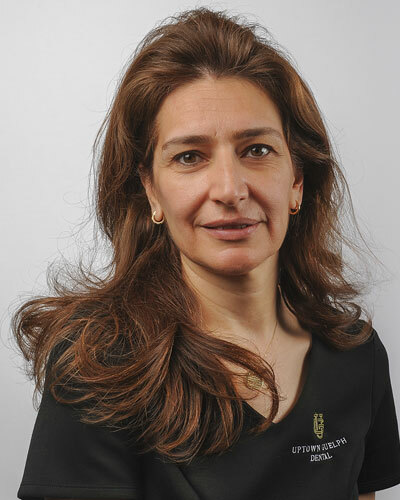 Shireen received her undergraduate degree in Computer Engineering from the University of Baghdad. After raising her kids, Shireen decided to return to the work field with a new career, as a dental assistant. She received her Diploma from the National Academy of Science and Business and was further certified as a dental assistant by the National Dental Assisting Examining Board (NDAEB). Shireen joined Uptown Guelph family a year ago and is happy to be a part of such a wonderful team. 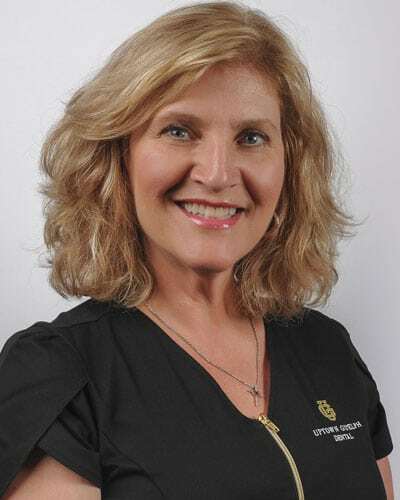 Her motivation and passion come from her interactions with patients, she strives to practice with utmost professionalism to provide them with the best care. Outside the office, Shireen is a wife and a mother to three lovely daughters, and a son. She is fluent in Arabic. Shireen loves to swim, watch movies and travel with family to explore new places and cultures. Chanelle graduated from Georgian College in 2014 and she is registered Dental Hygienist. She is presently working as a Hygiene and sterilization Coordinator. She enjoys with people and making sure that they leave with a smile. Chanelle loves animals, especially cats. She has a cat named Coco and loves spending time outdoors with her cat. She also has a dog named Fluffy who she loves to take for walks. Chanelle has an interest in hair and make-up and loves to practice on her friends. 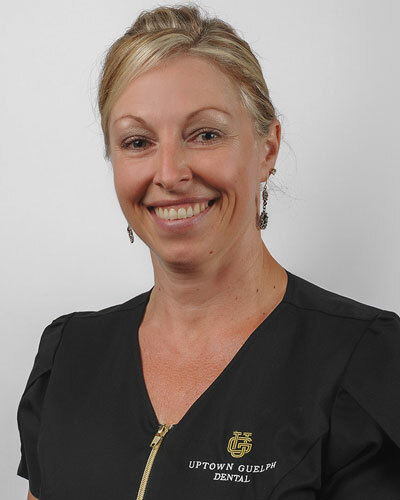 Out of her 25 years in dentistry, Liz has spent 18 with our practice! She graduated from Centennial CCUI in Guelph, and also studied at Sir Sanford Fleming College & Ontario Business College for Dental Assisting. Her favorite part of her job is meeting patients and helping them achieve a higher level of dental health. She has enjoyed getting to know our patients over the years and cultivating caring, supportive relationships with each of them. Seeing the younger patients become wonderful adults is particularly rewarding for her! Liz likes to spend time with her family, and to take long trail walks with Maya, her dog. She enjoys gardening and growing vegetables and collecting antiques with her husband. She is active on her small village’s committee, helping fundraise, promote local businesses and artisans, and give back to the community with family fun days and other great events. Additionally, she is active in her church. Marsha has been with our practice for 6 years, out of 19 total years in dentistry. She is a Certified Dental Assistant. She enjoys helping patients’ visits be as enjoyable as they can be. 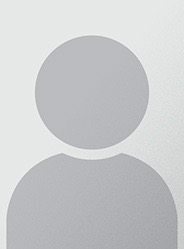 Her hobbies include Nascar and camping, and she enjoys spending time with her family. 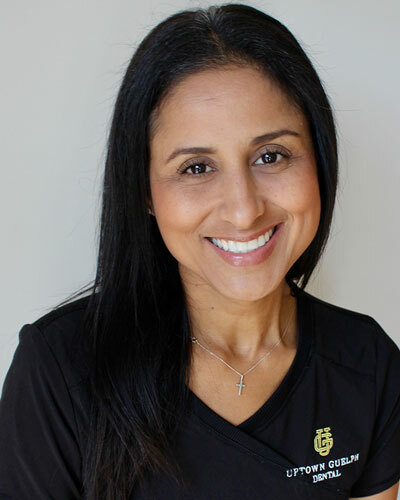 Mariel has 20 years of experience in dentistry, 2.5 of which she has spent with our practice. Her education is in cardio respiratory therapy, as well as dental assistance. 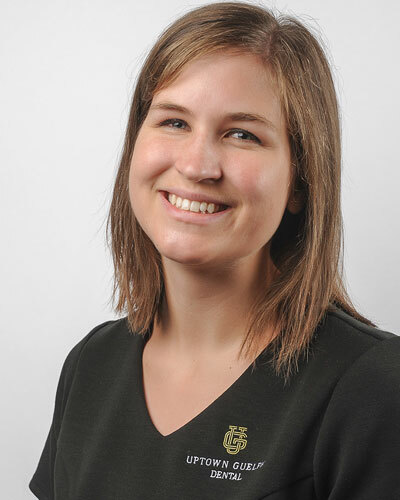 She enjoys the financial management aspect of her job at Uptown Guelph. Outside of work, Mariel enjoys travel, good food, good company and real estate.